Radon is a radioactive gas released by some types of rocks and soils as they break down in the natural decaying process. This gas percolates up through the soil and, when released into the air, dissipates quickly. But radon that seeps into a home gets trapped and can collect to high levels. Radon is formed by the natural radioactive decay of uranium in rock, soil, and water. Naturally existing, low levels of uranium occur widely in Earth's crust. 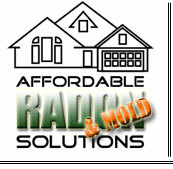 Radon is colorless, odorless, tasteless, and chemically inert. Once produced, radon moves through the ground to the air above. It can be found in all 50 states. Unless you test for it, there is no way of telling how much is present. The Surgeon General has warned that radon is the second leading cause of lung cancer in the United States. How much radon seeps into a house depends how it is built, the amount of radon in the soil under and around it and the composition of that soil. Radon enters through cracks in concrete floors and walls, around floor drains, sump pumps and drainage tiles, through construction joints and crawl spaces, through tiny cracks and pores in hollow concrete block walls and through pipe openings. Usually, radon levels are highest in basements and ground-level or on-grade rooms in contact with soil. Radon may also be found in drinking water. Some people who are exposed to radon in drinking water may have increased risk of getting cancer (especially lung cancer ) over the course of their lifetime. Radon from rock and soil under homes is the biggest source of radon in indoor air, and presents a greater risk of lung cancer than does radon in drinking water. The Safe Drinking Water Act, as amended in 1996, requires the U.S. Environmental Protection Agency (EPA) to develop a regulation to reduce radon in drinking water. On November 2, 1999, they published a proposed regulation. EPA is soliciting public comment on its proposed rule. They must receive comments, in writing, by 60 days after the November 2 publication date. A copy of the Federal Register notice of the proposed regulation and other information about radon in water can be obtained by contacting the Safe Drinking Water Hotline at (800) 426-4791. For additional questions/concerns, please contact us today!